Happy Sunday, everyone! I hope you've been enjoying your weekend! Thank you so much for your support and interest as I awaited the arrival of my second puppy-in-training. The response to the Name That Puppy giveaway was overwhelming! So, without further adieu, introducing... Brynn! 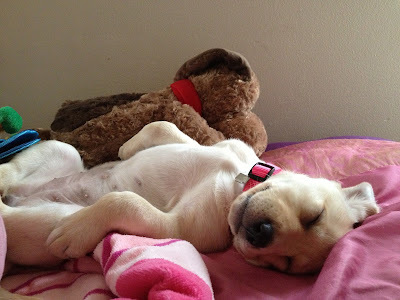 Brynn is a yellow labrador retriever and she's already enjoying living with my family. She is very cuddly and super sweet, too! This is how Brynn sleeps in her blankets on my floor... she already has a great personality! For more information on the Seeing Eye, visit their website SeeingEye.org. And who won the Name That Puppy Giveaway? Check the Rafflecopter widget below and see if you won! If you're the winner, please email me at PrincessPolishBlog@gmail.com! Such a cute little nugget!